Continuous casting is the process by which liquid steel is solidified into a semifinished steel product (billet, bloom, or slab etc.) for subsequent rolling in the hot rolling mills. Continuous casting of liquid steel was introduced for commercial application in 1950s. In the relatively short time span since the introduction of continuous casting for the commercial application, the process has evolved with a wide variety of new process developments directed towards achieving improved productivity and superior product quality. These developments include new design concepts of continuous casting machines, metallurgical practices, and the application of process control and automation by computer systems. The main driving force behind these developments has been the recognition that substantial improvement in the yield and energy savings are possible which have a dramatic effect on operating cost. Through these developments, it has been possible to achieve major quality improvements of the continuous cast product. Present day continuous casting machines produce cast steel products having quality which is fully equivalent to and exceeds that of products produced from ingot steel. Modern continuous casting machines efficiently produce essentially all grades of steels, including the highest qualities for critical applications. The two methods to improve the productivity of the continuous casting process include improving the continuous casting machine throughput (tons/hour) and net-working ratio. The through put of the continuous casting machine is improved by increasing the casting speed as well as by increasing the cross sectional area, while the net- working ratio is improved by decreasing the casting machine down time. The casting speed of the continuous casting machine is limited by several different phenomena as given below. A high casting speed results in a significant increase in the flow velocity of the liquid steel in the mould. Any slight disturbance in the flow of the liquid steel disturbs the formation of the solidifying shell in the mould, retards the floatation of the inclusions, and may lead to casting powder entrainment in the strand. Excessive level fluctuations and waves at the meniscus in the mould become worse with higher casting speed. This can cause surface quality problems and even sticker breakouts. This problem can be addressed by changing nozzle design (directing the flow more down ward, or possibly by adding a bottom vertical port), applying electromagnetic stirring, changing casting powder, and using other methods to control the flow pattern in the mould. High casting speed results into excessive axial strains caused by the oscillation and withdrawal forces needed to overcome friction at the interface between the solidifying shell and the mould. The associated transverse cracks and breakouts may limit casting speed, especially if there is misalignment, excessive taper of the mould, or a discontinuous liquid casting powder layer. Stresses are small if the liquid layer of the casting powder can be kept continuous over the entire mould surface and alignment is good. With high casting speed, excessive membrane strains may be generated in the thin shell by the ferrostatic pressure of the liquid pool below the mould. This can lead to cracks and breakouts if the shell is not thick enough at mould exit. The critical shell thickness must be of the order of 3 mm for most steel grades. This is easily achieved by any feasible casting speed, which shows that other criteria are more important. Any local non uniformity in the shell growth because of high casting speed can lead to locally hot and thin regions in the shell, which can initiate longitudinal cracks and breakouts even if the shell is above the critical thickness on average. This problem is normally addressed by optimizing the casting powder behaviour during initial solidification, oscillation practice, and taper design, such that casting powder lubrication is continuous, the initial heat flux is low and uniform, and the mould wall taper matches the shell shrinkage profile. Peritectic steel grades and austenitic stainless steel are most susceptible to this problem. Superheat of liquid steel entering the mould can also contribute to this problem, especially near the faces where the liquid steel jet impinges when casting with submerged bifurcated nozzles. Excessive bulging of the strand below the mould can results due to high casting speed and this may lead to a variety of internal cracks and even breakouts if the bulging is extreme. Bulging can be controlled by choosing enough support rolls, maintaining roll alignment, controlling spray cooling below the mould, and by avoiding sudden changes in roll pitch, sprays, or by reducing the casting speed. The distance below the meniscus of the point of final solidification of the center of the strand increases in direct proportion with casting speed for a given section thickness and limits the maximum casting speed in a particular continuous casting machine. The torch cut-off and roll support system must extend to accommodate this increase in metallurgical length. The metallurgical length cannot be significantly shortened by increasing the spray cooling intensity. Reheating of the strand below the end of the spray cooling zones can happen because of high casting speed. This reheating of the strand generates internal tensile stress and hot-tear cracks, which grow in severity with casting speed. This is to be taken care of during the design of the spray zones. The spray cooling zone must be extended to avoid these cracks. There are several special quality concerns, which sometimes impose limits on casting speed. For example, in ultra-low carbon steels, casting speed is limited to a relatively slow upper limit in order to reduce pencil pipe and other blister defects due to argon bubble entrapment on the inner radius of curved mould type continuous casting machines. Casting speed can only be increased in such situations by careful changes in operating conditions which can avoid these specific defects. Hence careful consideration of many different phenomena of concern is needed for increasing the casting speed. There are at least eight separate criteria which are required to be satisfied out of which five most important that can limit the casting speed for a given operation are temperature, bulging, strain, stress and fracture in the cast product. It is always necessary to find the critical casting speeds to avoid quality problems related to bulging below the mould. Break-out is one of the operational problem that affects most adversely the production of the continuous casting machines. It occurs as follows. During the initial solidification of liquid steel in a continuous casting mould, the solidification shell may not form adequately at some position for whatever reason, and when that position comes out of the lower end of the mould, liquid steel flows out through the defective part of the shell. Break-out does not merely decrease production, but inflicts heavy damage to the equipment, calling for extensive repair work. To prevent break-out, therefore, it is essential to ensure that sound initial solidification shell is formed stably in the mould. The principal factors that affect the initial solidification of liquid steel in a continuous casting mould are steel temperature, casting powder, mould copper lining, and primary cooling water. The essential for increasing continuous casting machine production on the basis of stable initial solidification is the maintenance of an adequate balance of the steel temperature in the mould, heat removal, and the casting speed. When both steel temperature and casting speed are high, the solidification shell does not develop sufficiently, and there may be a case where liquid steel breaks through the shell immediately below the mould (re-melting break-out). This indicates that, to increase production without break-out, the liquid steel temperature and casting speed must be controlled adequately. Increasing working time and casting time of a continuous casting machine is also an effective way for increasing the production of continuous casting machine. In relation to continuous casting machines, these terms are defined as follows. The keys to higher production capacity are how to decrease down time to increase the ratio of net working time to calendar time and how to decrease machine preparation time to raise the ratio of casting time. Productivity improvements can also be achieved by improving the net-working ratio. Net-working ratio can be improved by decreasing the continuous casting machine downtime and thus increasing the time that the machine is actually casting (machine utilization time) while maintaining the ability to produce the variety of cast steel product sizes and steel grades. To reduce the down time and to prevent casting machine troubles such as breakage of segment rolls and bearings, continuous casting machines normally undergo periodical shutdown for 12 to 24 hours in every three to four weeks for change of segments. 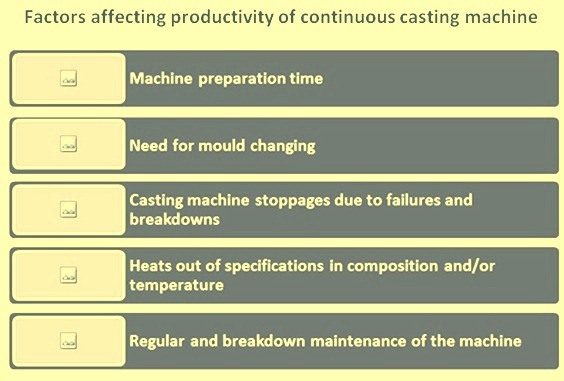 The following are the five major factors (fig 1) which contribute to downtime of the continuous casting machine and are required to be addressed. Maintenance of the continuous casting machine. In addition to improved control practices and techniques during steel making, the influence of these factors has been reduced by developing new operating concepts and equipment designs in the continuous casting machines. The major changes in operating concepts include the following. Slitting of the cast product to reduce the frequency of mould changing as well as to reduce the inventory of the mould. The number of heats cast through a continuous casting machine without interruption between insertions of the dummy bar differs from casting machine to casting machine depending on factors such as the size of a production lot of the same steel chemistry, service life of submerged entry nozzles, and occurrence of nozzle clogging and other troubles in the teeming system. The preparation work between the casts includes extraction of the final piece, insertion of the dummy bar, tundish change, and mould sealing. The final piece of the previous cast is carefully extracted to prevent bleeding, a trouble of molten slag or steel flowing out from the upper end, where solidification is often insufficient. To do this quickly is important to shorten the preparation time. As for the dummy bar insertion, the downward-inserting type is presently preferred because the dummy bar can be inserted while the final cast piece is being extracted. In case of using the upward- inserting type, in contrast, dummy bar insertion must wait until the final piece gets out of the casting machine completely, which increases the preparation time by 10 to 20 minutes. The quality of continuously cast steel is dependent on the steelmaking and casting practices employed. It is affected by the interaction of chemical and physical factors which must be closely controlled to obtain the full potential of the process. Typical defects experienced in continuous casting include the following. Surface defects such as (i) deformed cross?section (including concavity and convexity), (ii) cracks (longitudinal and transverse), (iii) laps, scale and entrapped inclusions and slag, and (iv) oscillation marks etc. Internal defects such as (i) cracks (central, diagonal and half?way), (ii) porosity, (iii) inclusions, and (iv) segregation etc. Crack formation takes place due to a wide range of physical causes. Techniques used to eliminate or reduce the occurrence of external and internal cracks include the following. Surface cracks – Mould and secondary cooling, mould lubrication, mould coatings, mould wear control, machine alignment and casting speed. Internal cracks (and porosity) – Machine type, machine alignment, electromagnetic stirring, in?line reductions, multi?point straightening, compression casting, liquid steel temperature and casting speed. Laps and scabs are related to casting speed control and the integrity of the pouring stream between the tundish and mould. Oscillation marks are a function of the steel grade cast and the type of mould oscillation. Pinholes and blowholes are controlled by deoxidation and tundish stream shrouding. Center line segregation has been minimized by low casting temperature, electromagnetic stirring and casting speed. The frequency of inclusions, whether at the surface, sub?surface or in the interior of the cast sections, has been progressively reduced through improvements, for example, in steelmaking, deoxidation and shrouding practices, and equipment design. These improvements form an integral part of a continuing effort to further upgrade the quality of continuously cast steel products. The most significant recent developments in improving product quality include the following. Air?mist cooling to further reduce the incidence of surface cracks. One of the primary objectives is to produce cast steel product with a surface which does not require conditioning prior to further processing. The requirements of steel users have diversified, and higher functionality is looked for in terms of weight reduction, better workability, and higher strength etc. Stricter control of surface defects and elimination of internal defects are now increasingly being demanded. All these, together with the pursuit of higher yield and productivity, have made the quality level required for the steelmaking and steel continuous casting processes highly demanding. On the other hand, it is true that such increasingly tougher user requirements have helped in bringing up the technical capability of the steelmaking and steel continuous casting practices. Minimizing inclusions in the mould is one of the most important quality issues of continuous casting. Inclusions deteriorate the mechanical properties of steel under tension, bending, hole expanding, press forming, and other types of working, and cause surface defects. Therefore, it is of great importance to minimize contamination of steel and remove inclusions from it in the continuous casting process. The typical surface defects originating in steelmaking processes are those due to inclusions of alumina and casting powder. They are caught in steel shell during initial solidification, and when the steel is rolled in rolling mill, they are stretched and form defects in streaks at the surface normally known as spills, scabs, or slivers. Such inclusions near a surface of cast product can be removed by scarfing, but since scarfing involves costs and decreases yield, it is preferable to minimize their entrapment during the initial solidification in the mould of the continuous casting machine. The mould electromagnetic stirring makes steel immediately inside the solidification shells to flow at a prescribed speed or faster to prevent inclusions from being entrapped in the shells. As regards casting powder, to prevent its entrapment, the viscosity of the powder is usually increased. Also the control accuracy of the liquid steel level in the mould is improved, the mould oscillation is modified, and the influx of liquid steel into the mould is rendered more stable. As a result, surface defects due to inclusions originating from the casting powder are decreased markedly. In addition, to minimize the amount of inclusions getting to the mould, measures are taken to separate inclusions from steel in the tundish as much as possible. One such measure is enlargement of the tundish capacity. A tundish serves as an intermediate holder to ensure stable steel flow from the ladle to the continuous casting mould, and in case of a multi strand casting machine, distribute steel to the strands. By increasing the tundish size, it is possible to let inclusions float up to the liquid steel surface more easily and to suppress the suspension of slag in steel at the teeming position from the ladle.